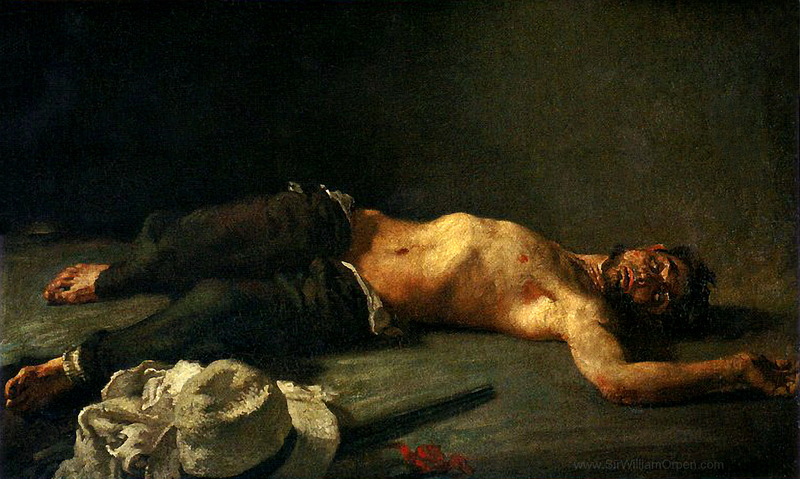 The Revolutionary (circa 1902) by Sir William Orpen. Displayed alongside the iconic Men of the South (1921-22) by Orpen’s student, Seán Keating, this painting considers the possible fate of those who serve in conflict. This is, however, an earlier conflict than the Irish War of Independence. When conceiving of this work, the artist was likely mindful of the Second Boer War (1899-1902) in which Irishmen fought on both sides, either in British Army regiments or in the Irish Transvaal Brigade under John MacBride (1868-1916). The title and clothing of the fallen revolutionary suggests he fought on the side of the Boers. Although later an official war artist of the First World War (1914-18), Orpen likely derived this painting from a studio model. Noted for his portraiture, the artist also emphasised the importance of life-drawing in his teaching at the Dublin Metropolitan School of Art (now National College of Art and Design). This is evident in the work of his students – Margaret Clarke, Seán Keating, Patrick Touhy, Leo Whelan – as well as in his sensitive (and sensual) description of male anatomy in this painting. The Revolutionary by William Orpen features in HEROES & VILLAINS (Gibson Galleries, Floor 1) until 14 April alongside Seán Keating’s Men of the South and John Lavery’s The Widow (Mrs Terence MacSwiney, Lady Mayoress of Cork 1920). Open daily, free entry.